This metal knock-down wardrobe makes for good storage space in the bedroom. The overhead unit creates convenient space. Option of multiple drawers and lockers is available. Stylish, Modern, Affordable! The new Slim line range of cupboards from Godrej Inetrio Home is ideal for the new generation. Its contemporary styling, sleek lines, duo-toned colours and sturdy design is a marriage of style and utility. And the most delightful part is that it is affordable. 2 door body is available only in Ivory. 3 door body is available in Ivory and Metallic silver. Minor, Compact, Combi door are available only in Pacific Blue, and Russet and Ivory color, Twin door is available only in Pacific Blue. Needs grow and Godrej Kreation wardrobe grows along with your needs. 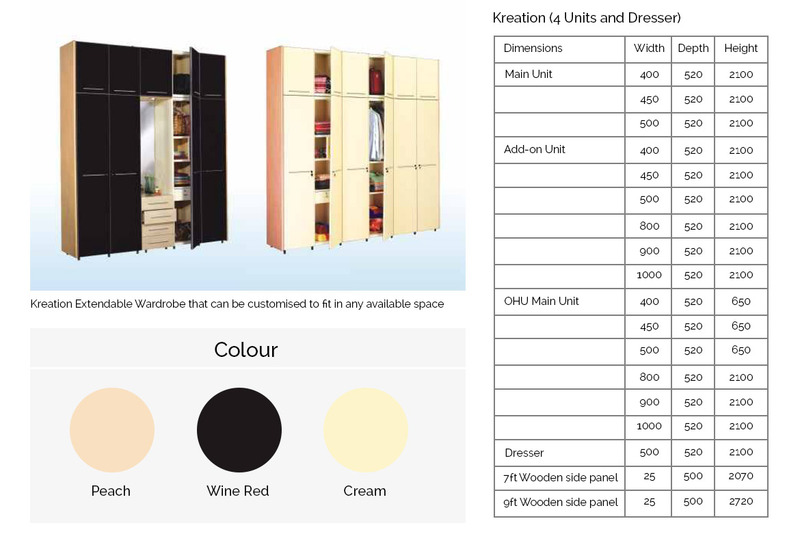 Kreation is an innovative, extendable wardrobe concept, modular in nature, that keeps up with your demands. You can begin with a basic main unit and just keep adding more units, as required. Various add-ons are available (eg. dresser in wood, with focus light, study table, media unit), its looks complement the best interiors and its strength lasts a lifetime. The product is perfectly suited for a single person in a small apartment or a big family in a large independent home with the beauty of wood, and the strength of steel. The wooden side cladding gives the wardrobe a warm look and can suit any decor of your home. The standard steel components have been designed for maximum layout flexibility,light weight yet strong, while the products are easy to assemble, and dismantle, with special fasteners, and knock-down construction. Its flat pack body makes it easy to transport, and lift to high-rise apartments.